can ever become better without true reflection." The process is quite simple ... you provide a list of questions and points to serve as a frame for their reflection. And then you review their reflection and help them understand the process to gain more from it. Right now, with our Niagara College program, we are in the middle of activities to increase our players Soccer IQ. The first set of questions frustrated me but I knew many of them were probably never taught to talk about the game or themselves with an analytical mind ... they probably just played it (and that's OK). Once this phase is complete we will begin to refine the reflection process. I don't think any coach, player, teacher, priest, etc, can ever become better without true reflection. If we don't train our players how to reflect, their reflection might be "it was good". What did you have for your last meal? Was training set up when you arrived? Were you in the mood to learn today? Why? why not? If you could change one thing leading up to your arrival today, what would it be? Is there anything you noted last session that you wanted to address today? How did you feel your performance would be today before you arrived? How was your performance today? What part of today's performance would you like to improve? 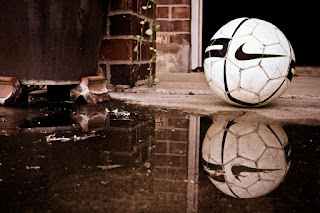 Have you touched a ball since your lest session? Was the session enjoyable? Why? Why not? Do you feel you improved? Why? Why not? Is there anything about today's session that you want to address next session? Your next step is to organize how the reflection is done and how you will implement it into your team's routine. If you are at the early stages of showing players how to reflect, you need to review their reflections with them. I believe this is one of those processes where you frame the conversation but their own discovery has to be the true teacher. Please remember to not assume your players know how to reflect. And don't underestimate how important it is.